Dr. Khan’s wide range of specialties include preventative dentistry, periodontics, prosthodontics, oral surgery, endodontics, and smile enhancements. For his undergraduate education Dr. Khan attended Muhlenberg College in Pennsylvania and then went on to Tufts University School of Dental Medicine. Immediately after earning his degree, he became a Clinical Instructor in Restorative Dentistry at Tufts from 1993 – 1998. Among his many specialties, Dr. Khan is particularly strong in periodontics, having won the periodontics award while studying at Tufts. 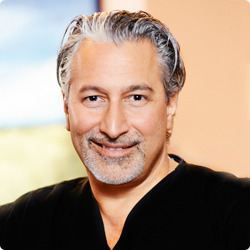 He places a strong emphasis on periodontal health when caring for and advising his patients. Dr. Khan is a member of the American Dental Society and Massachusetts Dental Society, as well as the Metropolitan and Merrimack Valley District Societies. He is also an avid sports fan and enjoys exercising and running in his free time. If you would like to schedule an appointment with Dr. Khan, please call our Billerica dentist office today.